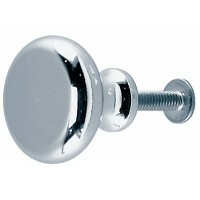 Highly polished finish, attractive, functional and ideal for all storage compartments. Eye swivel to.. 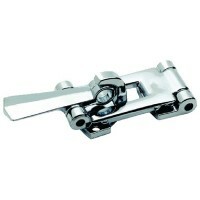 Die cast zamak with Perma-Plate chrome finish. 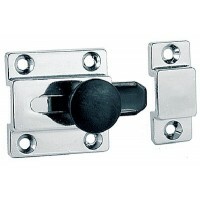 Ideal for tackle boxes, ice boxes, dock boxes, hatche..
Chrome plated zinc with black plastic slide and knob. 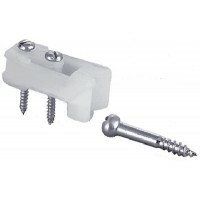 Size: 2-1/8" x 1-1/2"Fastener: #6..
Screw size is 6. 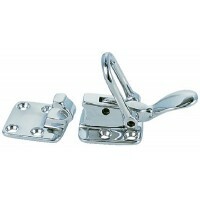 Size: 3-3/4" L x 1" W, 1/4" Clearance..
Hook door keeper only 2/cd Size: Spare Keeper for 0998DP 2/CD.. 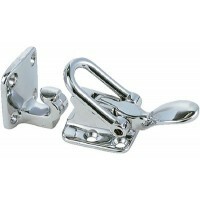 Sand cast chrome plated brass. Carded. 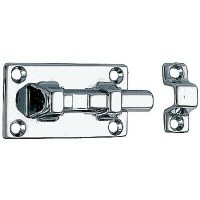 A: 4-1/2"Fastener: #10 FHB: 1-1/16"C: 1/4"D: 1-13/16"..
Chrome plated extruded brass. Carded. 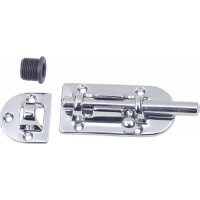 A: 2"Fastener: #5 FHB: 3/8"C: 1/2".. 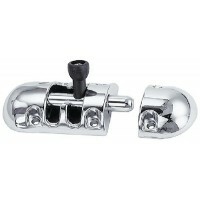 Sand cast brass chrome plated. Carded. 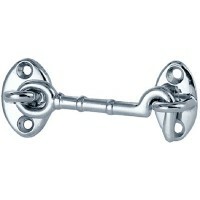 Fastener #5 FH. 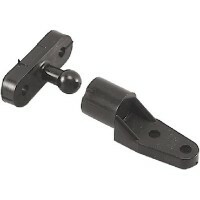 A: 2-7/8"Fastener: #5 FHB: 3/4"C: 1/2"..
Carded. 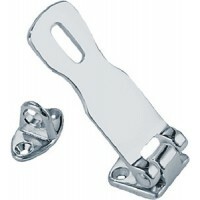 A: 3"Fastener: #6B: 5/8"C: 11/16"D: 3-3/4"..
Carded. A: 2-1/4"Fastener: #6B: 5/8"C: 11/16"D: 3"..
Carded. 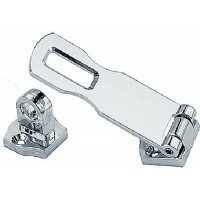 A: 3-1/4"Fastener: #6B: 5/8"C: 11/16"D: 4"..
Chrome plated brass. Carded. 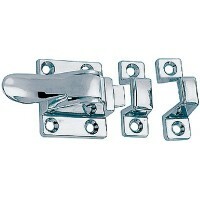 A: 2-3/4" x 13/16"Fastener: #6 FHB: 13/16"C: 13/16"D: 3/4"..
Extruded brass. 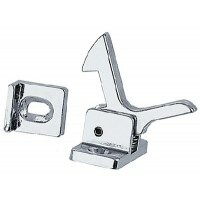 Card: 2A: 1-1/8"Fastener: #5 FHB: 1-5/16"Finish: Chrome..
Chrome plated extruded brass. Carded. 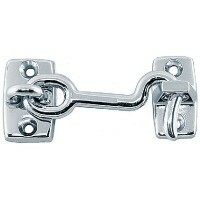 Fastener #5 FH. 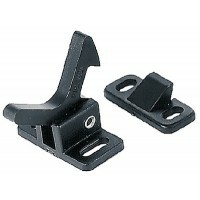 A: 1-1/2"B: 1-1/2"C: 1"D: 3/4"..
Injection molded nylon. 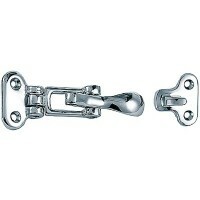 Card: 4A: 1/2"Fastener: #6 RHB: 1-3/16"..
Chrome plated brass. Carded. 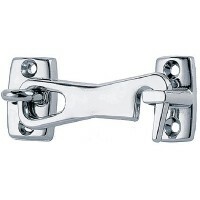 A: 2" x 5/8"Fastener: #6 FHB: 13/16"C: 13/16"D: 3/4"..
Machined AISI 304 stainless steel. A unique plastic bushing in the eye prevents accidental unhooking..
Machined AISI 304 stainless steel. Carded. 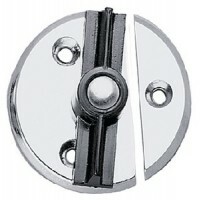 A: 2-3/8"Fastener: #8 FHB: 1"C: 11/16"..